The city of Edinburgh seems to have vibrancy emerging around almost every corner, with the multitude of museums certainly adding a splash of culture. Amongst the most notable is the Museum of Edinburgh, which is situated within the historic Huntly House, on the city's famous Royal Mile. 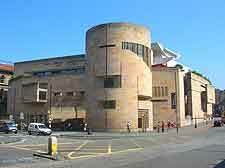 Standing on Chambers Street and near to the Bedlam Theatre, the Museum of Scotland is another of Edinburgh's finest and is known for its modern architecture, dating from the late 1990s. Here you will discover large gallery spaces showcasing Andy Goldsworthy and Eduardo Paolozzi sculptures, Margaret MacDonald paintings, and much more besides. Families in Edinburgh may prefer to spend an afternoon at the Museum of Childhood, where nostalgia and old toys are in abundance. 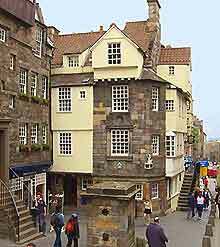 This old-fashioned attraction is one of the most important museums in Edinburgh and is housed in three original tenements, opposite the Cannongate Tolbooth. Highlights here include the National Covenant, Greyfriar's Bobby's actual collar and feeding bowl, and numerous local artefacts - many of which date from Roman times. The ancient buildings were connected in 1570 and the architecture is of particular note. Located in the Old Town area, the Museum of Scotland is amongst the city's most popular and features many attractions for tourists and visitors. With a number of exhibitions explaining the history of Scotland, exhibits include historic Scottish artefacts, fossils, ancient jewellery, geological exhibits and much more besides. 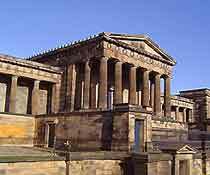 Founded in 1998, this important cultural attraction was designed by Bensin and Forsyth in 1998, and houses all of the Scottish artefacts owned by National Museums of Scotland, many of which were previously on display in the Portrait Gallery. The Newhaven Heritage Museum stands within the Leith dockland area of Newhaven, where it celebrates the local history of this charming fishing port, from its origins as a 16th-century naval shipyard. Attractions here include numerous local artefacts, paintings and many temporary exhibitions throughout the year. There are also often special events designed for children and families. Nearby Claremont Park is on hand if you are in need of some greenery. 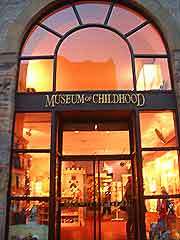 The Museum of Childhood is suitable for everyone visiting the city of Edinburgh and is certainly not just for children. Founded by local councillor Patrick Murray in 1955, this highly family friendly attraction comes with many small and interesting rooms, crammed with historic toys, numerous dolls houses, toy circuses, train sets and general children's paraphernalia. Other highlights include temporary themed-exhibitions and a gift shop with lots of tempting toys. Located in close proximity to the Parliament House and St. Giles' Cathedral, the Royal Museum stands next to the Museum of Scotland and boasts a stunning atrium and lofty Victorian galleries. This grand Victorian building is full of interesting and typical exhibits, including geology, anthropology, fossils, taxonomy, costumes, Chinese art, the oldest steam engine in the world, enormous whale skeletons and industrial artefacts. There are also a number of glass cases full of stuffed animals and various temporary exhibitions throughout the year. 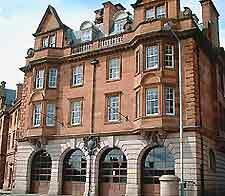 The Edinburgh Museum of Fire is one of the most striking in the city, since it features an especially imposing red sandstone exterior and grand Victorian architecture. This interesting attraction has many fascinating displays, which detail the history of the oldest fire brigade in the United Kingdom. Highlights include historic fireman's uniforms, steam engines, fire equipment and fire engines, some of which are more than 200 years old. The Museum of Fire is located in the Old Town area, near West Meadow Park and the College of Art, and guided tours are available if required. The National Library of Scotland can be found in the Old Town area and houses Scotland's national collection of books and documents. With more than seven million books in total, together with manuscripts, maps, and historical papers, the National Library of Scotland features many temporary exhibitions throughout the year. Of particular interest is a 14th-century map of the world and an original letter written by Mary, Queen of Scots. The Queensferry Museum can by found in the suburbs of Edinburgh and celebrates the growth and history of this area. Attractions at the Queensferry include memorabilia from the Royal family, displays about the Forth Estuary and a powerful telescope, which provides stunning views of the surrounding countryside. The Maid of the Forth and the Forth Road Bridge are sited close by should you wish to cross the Firth of Forth estuary. The Writers' Museum, in the Old Town area of Edinburgh, is set in a charming 17th-century house, which is full of history and character, and named the Lady Stairs House. With exhibits, displays and extensive memorabilia about many famous writers, such as Robert Burns, Sir Walter Scott and Robert Louis Stevenson, there are many rare collections here to satisfy your literary interests. Of note, the Princes Street Gardens and the National Gallery of Scotland are both within walking distance. The Scottish Agricultural Museum stands on the westerly outskirts of the city and close to the airport. Visitors can expect to discover fascinating exhibits and displays relating to historic country life in Scotland and the Midlothian area. Particular attractions include photographs, audiovisuals, books, tools, ancient farming machinery, a tearoom and a gift shop with a basic selection of souvenirs and postcards. With extensive exhibits spanning more than 400 years of Scottish military history, the National War Museum of Scotland is one of the most historic of its kind in the city. Recently upgraded and now featuring six new spacious galleries, themed exhibits include ancient soldier uniforms, swords and many other types of war paraphernalia.